Handling Time : Approx 30-40 business days. 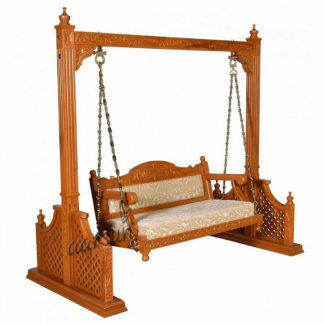 Aarsun woods brings you handcrafted Wooden Swing made with fine quality wood .The beautiful swings add a touch of style and a lot of comfort to your garden.Wooden Swing is traditionally handcrafted in premium quality Teak Wood. 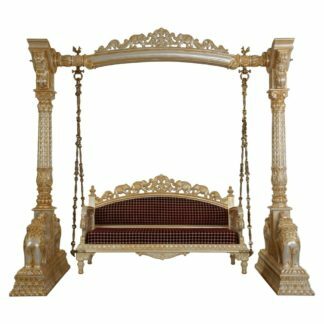 Wooden Swings can be placed inside a living room / roof-top / terrace as well as outside in the garden area.The unit consists of 2 pillars on sides with hand-carved Peacock theme and floral pattern designs. The main swing chair is sturdy enough and is also made of Teak Wood. The chair is attached from the top with metal chain attached. The chain has a rugged shine with a matching design. The Swing Chair has floral carvings. Overall the unit is polished in Walnut Finish. Moisture Resistance: Sagwan Wood Swing has a good resistance to moisture and water. High Dimensional Stability: Teak wood does not warp or shrink as compared to other wood materials.